Introduced in 1948, the Ford F-150 owns the distinction of being the most popular motor vehicle of all time. 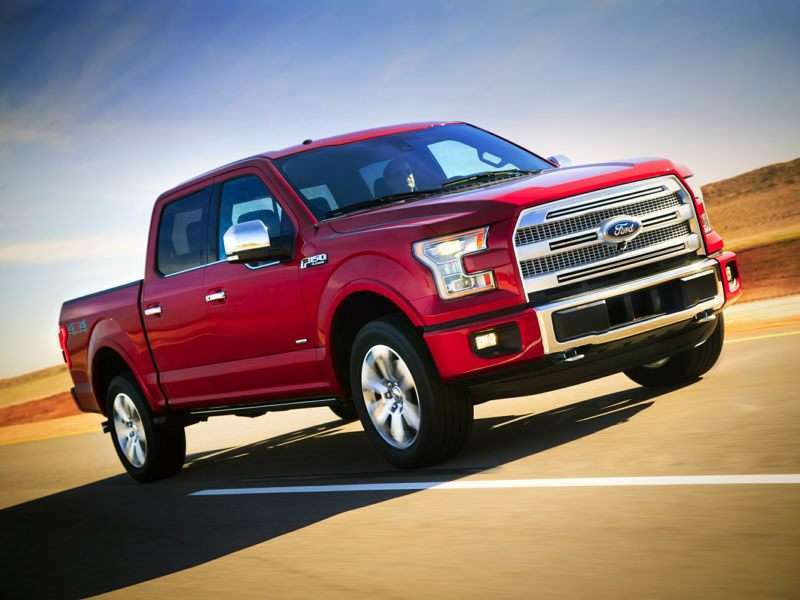 For well over 30 years, the F-150 has been the best-selling vehicle in the United States. Further, for more than 40 years, it has been the best selling pickup truck. Clearly Ford is on to something here. 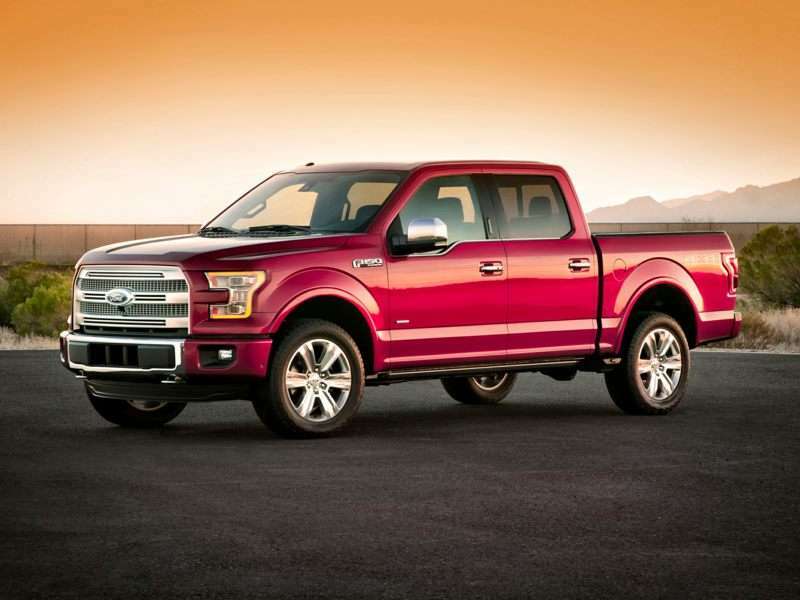 Currently in its 13th generation, the contemporary edition of the highly regarded Ford is the first pickup truck to rely heavily upon aluminum construction, which has reduced its curb weight by some 700 pounds. Over the years, there have been many different variants—high performance iterations, off-road-oriented models, luxurious examples, and, of course, plain-Jane work versions. Beneath them all, however, the honesty of the F-150’s robust nature always shines through. There’s no question about it, when all is said and done, regardless of the veneer with which Ford’s product planners have chosen to adorn the F-150, at its essence the Ford is simply a very tough pickup truck. 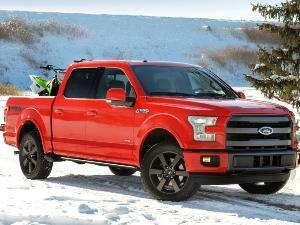 Is there any wonder the Ford F-150 is the best selling vehicle in America? According to Ford’s spokespeople, there are more F-Series trucks on the road with 250,000 miles or more on them than any other brand. This is absolutely by design. For example, the all-new Ford F-150 was put through more than 10 million miles of testing before it was offered for sale. It crisscrossed the country, pulling trailers and hauling loads through deserts and over mountain passes in temperatures from 20 degrees below zero Fahrenheit to 120 degrees above. A disguised version of the all-new model even ran the Baja 1000 during its development process. All of its mechanicals were stock, save the addition of a 44-gallon fuel tank as well as shocks and springs calibrated to deal with long distance high-speed off-road running. The only maintenance required was changing the air filter at every stop. Other than that, the truck ran flawlessly. Reliability is a key attribute, when you’re asking why the Ford F-150 is the best selling vehicle in America. 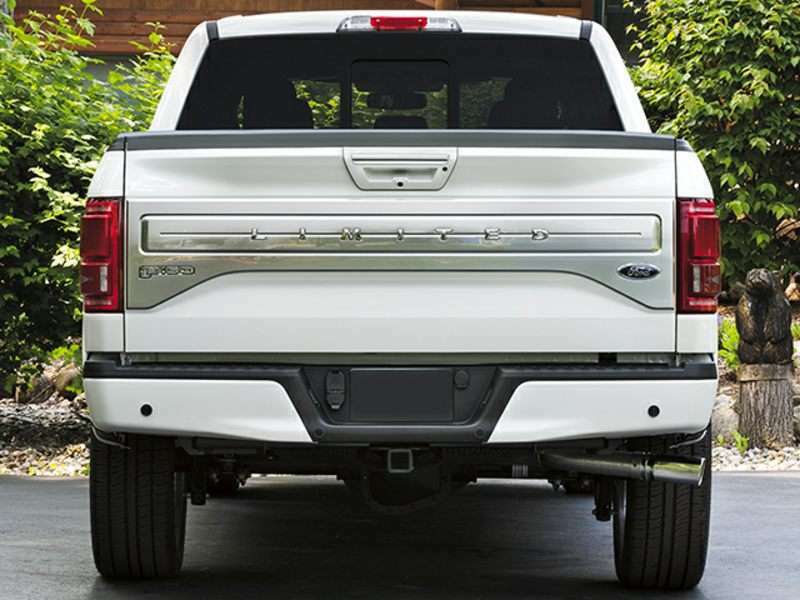 Over the last two generations of the F-150, Ford’s engineering teams have paid especially close attention to improving the fuel efficiency of the venerable pickup. 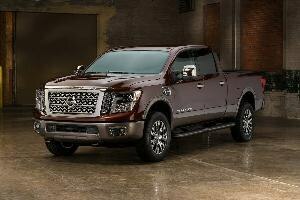 The adoption of military grade aluminum alloys and other weight saving measures have shaved some 700 pounds off the curb weight of the current version of the pickup. 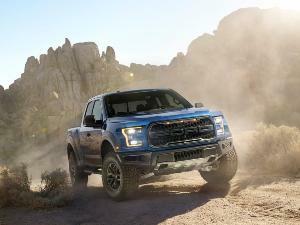 This, in combination with Ford’s innovative 3.5-liter turbocharged EcoBoost engine, has preserved the power and strength of the Ford F-150, while also endowing it with a remarkable fuel economy story. Generating 365 horsepower and 420 ft-lbs of torque, this remarkable engine delivers V8 power with the fuel consumption of a V6. We’re talking 19 miles per gallon in the city, 26 on the highway, and 22 mpg in combined city/highway operation (with the rear-wheel drive powertrain). Despite its newfound lightness, or perhaps because of its newfound lightness, the 2016 Ford F-150 is easily one of the most capable pickups on the road when it comes to dragging stuff and/or hauling it away. Four engine choices are offered within the F-150 platform. The base 282-horsepower 3.5-liter normally aspirated V6 makes 253 ft-lbs of torque and is good for a max tow rating of 7,600 pounds or a payload of 1,910 pounds. The 2.7-liter turbocharged V6 makes 325 horsepower and 375 ft-lbs of torque, and will tow a maximum of 8,500 pounds. This engine is good for a payload of up to 2,250 pounds. The Ford’s 5.0-liter V8 makes 385 horsepower and 387 ft-lbs of torque. 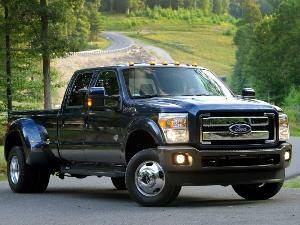 This engine endows the F-150 with 11.100 pounds of towing capability or a maximum payload of 3,300 pounds. 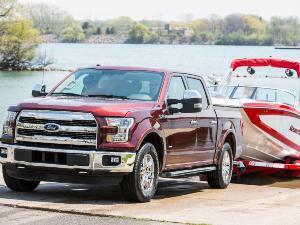 The 3.5-liter turbocharged V6 we discussed previously enables the F-150 to tow a remarkable 12,200 pounds, or haul a 3,270-pound maximum payload. 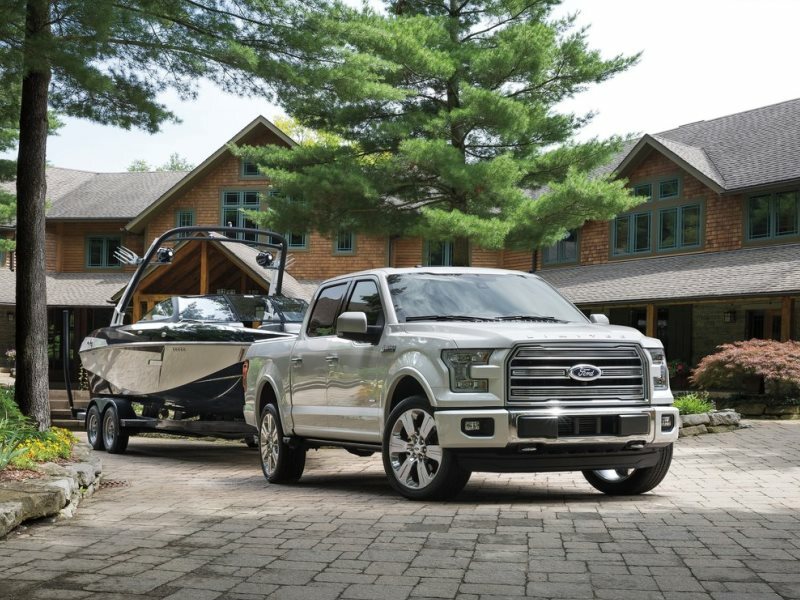 Ford offers the 2016 F-150 in six trim levels, ranging from the entry-level utilitarian bare-bones XL work truck with vinyl flooring to the full-boat Limited trim. Along the way, a wide variety of optional features permit tailoring the 2016 Ford F-150 to each individual owner’s specific needs and desires. While there are off-road packages for those who have to deal with rugged trails, features like automated parking, retractable running boards, and smart cruise control hold considerable appeal for those who spend more time in urban environments. Further, there are three different cab styles (regular, extended, and crew), as well as three different bed lengths (5.5 feet, 6.5 feet, and eight feet). Standalone optional features include skid plates, running boards, tailgate and box side steps, a spray-in bedliner, a rear proximity sensor array, trailer packages, a variety of axle ratios, and an integrated trailer brake controller. 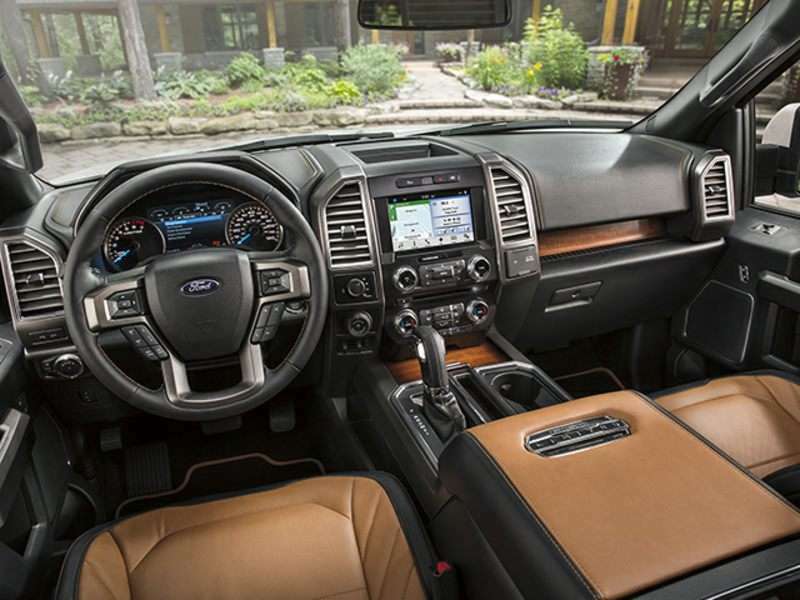 When the new F-150 was being designed, the development team took a look at the way users interacted with the truck and built in a number of features to make living with the Ford more pleasant. As an example, they designed the inside door handles with sculpted finger holds to make the doors easier to close when wearing gloves—which a lot of people who use trucks for work have a tendency to do. Similarly, grooves in the tailgate handle provide a better grip when opening and closing it with one hand. The box step is designed to accommodate a full-size work boot, making it easier to stand upon and push away beneath the Ford when it isn’t needed. The F-150’s steering wheel also features finger holds on the back to improve the driver’s grip, and the four-spoke design allows for comfortable use of the bottom of the steering wheel. 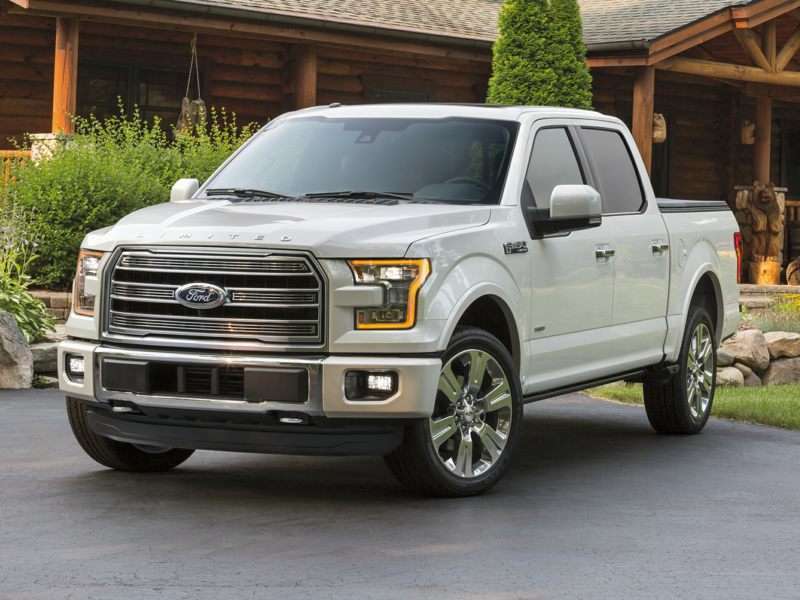 While we briefly alluded to this earlier, the fact of the matter is that you really can equip the 2016 Ford F-150 like a luxury car. An eight-inch touchscreen with physical volume and tuning knobs for the radio make dialing in the audio system particularly easy—especially while wearing work gloves. The 2016 Ford F-150 can also be equipped with heated and ventilated 10-way power adjustable seats upholstered in leather, heated seats for second row passengers, intelligent cruise control, and a crisp-sounding Sony audio system with 10 speakers, in addition to keyless access and push-button start. While these are items you’d quite rightfully expect to find on a Lincoln Navigator’s feature list, they’re numbered among the offerings of the F-150, too. Naturally, ABS, traction control, stability control, trailer sway control, and a full complement of airbags number among F-150’s standard safety features. 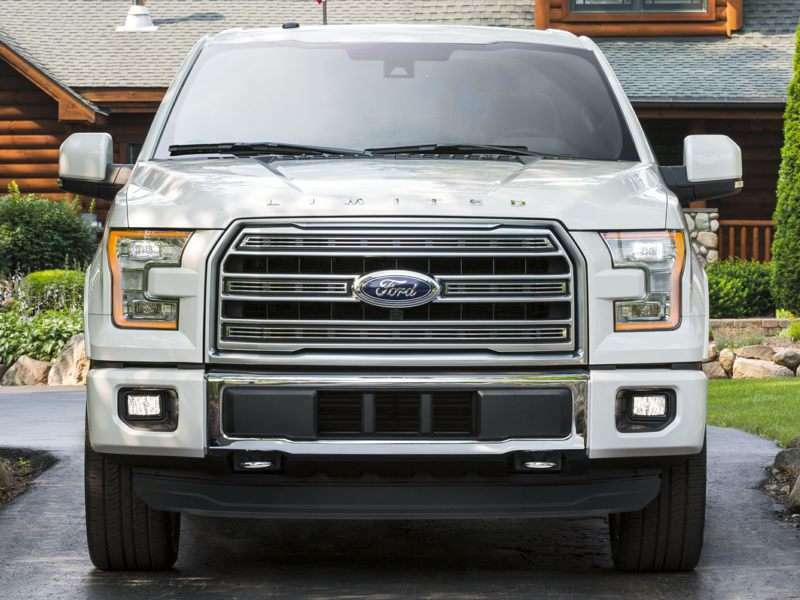 Among the cutting edge electronic safety features offered with F-150 are a 360-degree multi-view camera system and a rear parking sensor array. Other driver’s aids include forward collision warning, forward collision mitigation with automatic braking preparation, and lane departure warning. Rounding out the elements of the available safety features list are rear cross traffic alert, blind spot monitoring, and inflatable seatbelts (in crew and super crew cabs). That whole full-boat-the-next-best-thing-to-a-Lincoln plushness thing also applies to the way the F-150 feels going down the street—even when unladen. Old-school pickup trucks rode notoriously rough when driven without a load. The proverbial empty wagon syndrome applied heartily to those machines of yore. Meanwhile, the 2016 Ford F-150 could care one whit whether you’re approaching its max payload, or driving around with a totally empty cargo box. 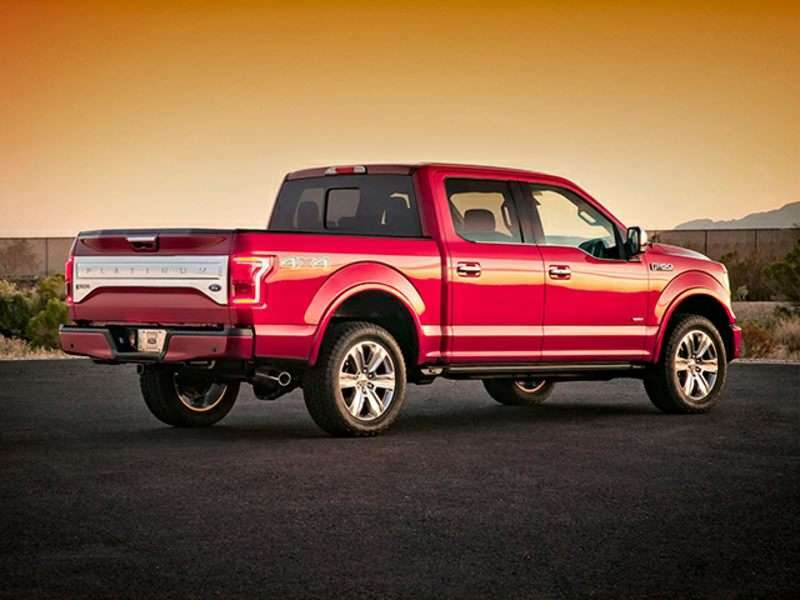 Further, thanks to the significant reduction in curb weight, the F-150 feels more agile, lighter on its feet, and, dare we say, more car-like than ever before. The suspension system is calibrated to provide a smooth ride, the steering is nicely responsive, and the brakes are exceptionally resolute. And, lest the size of the F-150 give you pause to take it into the city for fear of being unable to park it, the Ford’s automated parking feature completely frees you of this concern. The truck parks itself. Interestingly, even with all of the wondrous engineering innovations going on beneath the surface, one aspect of the Ford F-150 remains remarkably conservative. When it comes to the exterior styling, the look is fresh enough to stand out as a revised model, but it’s traditional enough to maintain its appeal to legacy buyers. And frankly, if there’s one primary reason the Ford F-150 has held onto the top spot for so long it’s reflected in the fact Ford knows exactly who its customer is (or, said more precisely, who its customers are) and what they want. Yes, the company’s designers and engineers pay attention to current market trends and do everything they can to ensure the F-150 measures up. But the way they do it is calculated to ensure the truck never becomes so radical it leaves its core customers behind. Yes, people are using pickups as their daily drivers more and more, but they also still press them into service for truly hard (and sometimes dirty) work. The beauty of the F-150 is it can pull off the hard tasks while still coddling its occupants with the latest and greatest in comfort and convenience features.